In April 2019, The Philadelphia Business Journal honored the partnership between Ceiba and Santander bank as part of its annual Faces of Philanthropy event that recognizes excellent partnerships between non-profit organizations and for-profit companies. Ceiba and Santander were honored for their pilot program that enables low-to-moderate income immigrants to save and secure low-cost loans for expenses associated with attaining U.S. citizenship. Since 2017, Santander has donated $450,000 to Ceiba and its coalition of organizations in support of programming in greater Philadelphia. Thirty-nine Santander volunteers dedicated more than 150 hours to provide support in two important ways – tax assistance and pro-bono legal services. Santander staff provided free tax assistance to 264 of Ceiba’s clients through sessions offered during tax season. On Friday, April 12th, and Saturday, April 13th, Ceiba hosted a Philadelphia Municipal ID Pop-Up Event from 10AM-3PM during its free tax preparation days. Over 100 people from Ceiba’s community were issued IDs during the event. On Saturday, March 30th and Saturday, April 6th, Ceiba organized a Pre-Purchase workshop for members of it’s Ira Lubert Matched Savings Program for First-Time Homebuyers. To mark the one year countdown to the start of Census 2020, Ceiba organized a Workshop/Rally to inform community residents, Latino nonprofit stakeholders and the Hispanic media about the significance of the upcoming Census and the urgency of working to ensure that there is a complete count in our neighborhoods. The location and backdrop of the Workshop/Rally buttressed the call to action and highlight the resources available to help people engage in the Census effort. Ceiba is the leading advocacy and coalition building organization in Philadelphia's Latino community. Ceiba's Executive Director, Will Gonzalez, is a member of the Philadelphia Complete Count Committee. He is nominated to be the Chair of the Immigrant and Limited English Proficiency Subcommittee of the Philadelphia Complete Count Committee. Ceiba is also active in helping unauthorized immigrants build their economic base by using free tax preparation and application assistance for Individual Tax Identification Numbers (ITINs) as gateways to asset-building. On select Mondays, Ceiba organizes ITIN information workshops. Those workshops are well attended. On Monday, April 1, 2019, Ceiba will leverage the audience that attends its ITIN workshop. It will schedule the ITIN workshop to maximize the opportunity for ITIN workshop attendees to participate in the Census Workshop/Rally. The participation of unauthorized immigrants at the event will highlight the challenges to a complete count posed by the possible addition of a citizenship question in the 2020 Census. At the Workshop/Rally, Ceiba shared NALEO's t-shirts, postcards, pledge cards, bottoms, and additional relevant materials. On Saturday, March 23rd, 2019, at 11 AM, Ceiba and Esperanza Immigration Legal Services (EILS) will organize a free immigration legal screening + immigrant emergency readiness plan preparation clinic. The event will take place at Ceiba, located at 174 Diamond St. Philadelphia PA 19122. “It is important that unauthorized immigrants with children speak with family attorneys about the guardianship of their children in case of detention, especially in Pennsylvania, as the Commonwealth's laws do not offer an easy way to assign guardianship,” expressed Taylor De La Peña, Ceiba's Director of Operations. “Unauthorized immigrants should prepare for the possibility of detention not only by preparing an emergency readiness plan, but also by getting screened by an immigration attorney for possible relief as soon as possible,” added Alexis Duecker, Executive Director of Esperanza Immigration Legal Services. At the session, Ceiba and EILS will also inform attendees of their rights if stopped by ICE. For more information and to register for the session, call 215-634-7245. On Saturday, February 23rd, 2019, at 11 AM, Ceiba and Esperanza Immigration Legal Services (EILS) will organize a free immigration legal screening + immigrant emergency readiness plan preparation clinic. The event will take place at Ceiba, located at 174 Diamond St. Philadelphia PA 19122. On Tuesday, February 12th, Ceiba organized a training with Stephanie Gonzalez of Gonzalez Ferrandez Law to train service providers in how to prepare guardianship documents for unauthorized immigrant parents in case of detention by ICE. On January 9th, 2019, Erika L. of Ceiba’s Ira Lubert Matched Savings Program for First-Time Homebuyers graduated and purchased her first home. Congratulations, Erika! 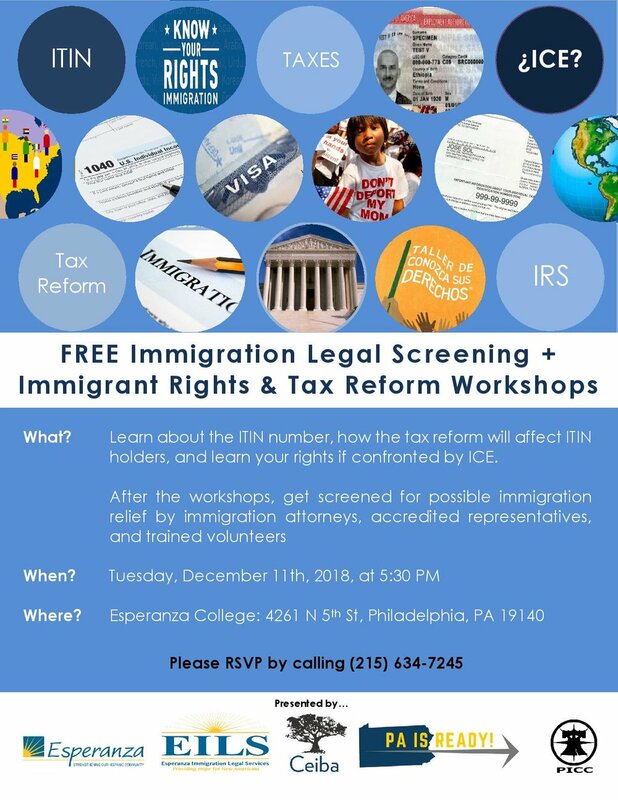 On Tuesday, December 11th, 2018, at 5:30 PM, Ceiba and Esperanza Immigration Legal Services (EILS) will organize a free immigration legal screening clinic and workshops on immigrant rights and tax reform. At the session, EILS and Ceiba will educate the community on Individuals Taxpayer Identification Numbers (ITINs), how recent changes in tax law will affect ITIN holders, and immigrants’ rights if stopped by ICE. After the workshops, EILS, Ceiba, and a team of trained volunteers will perform comprehensive immigration legal screenings for all types of immigration relief, including asylum, family petitions, U-Visas, and VAWA. The event will take place at Esperanza College, located at 4261 N. 5th St., Philadelphia PA 19140. “In the wake of ‘Trump’s Tax Reform,’ there is a lot of confusion in the immigrant community regarding the coming tax season. At the session, we will inform taxpayers of tax changes that could affect them in 2019,” expressed Taylor De La Pena, Ceiba Program Coordinator. “Unauthorized immigrants should get screened for possible immigration remedies as soon as possible, as applying for legal status and eventual citizenship is the only permanent protection from deportation,” said Alexis Duecker, Executive Director of Esperanza Immigration Legal Services. As part of the session, Ceiba and EILS will also inform attendees of their rights if stopped by ICE. On November 8th, 2018, Ceiba organized an “On the Table Philly” event to discuss issues of gentrification and displacement in Eastern North Philadelphia, Ceiba’s community. Ceiba brought together non-profit employees who work within the community to discuss issues, problems, and potential solutions to the displacement of families in rapidly gentrifying areas. This discussion encouraged the collaboration of Spanish-speaking Latino oriented non-profits in Philadelphia to enhance equitable development in our communities. Ceiba’s talk took place in Spanish and catered to a diverse Pan-American mixture of participants. On Thursday, November 15, 2018, at 5:30 PM, Ceiba and Esperanza Immigration Legal Services (EILS) will organize a FREE immigration legal screening clinic and workshops on immigrant rights and tax reform. The event will take place at Ceiba, located at 174 Diamond St., Philadelphia PA 19122. On Tuesday, October 16th 2018, at 4:30 PM, Ceiba and Esperanza Immigration Legal Services (EILS) will organize a Public Charge Information Session. The event will take place at Esperanza College, located at 4561 N. 5th St. Philadelphia PA 19140. At the session, EILS and Ceiba will partner with Community Legal Services (CLS) to share information about the proposed rule. “It is imperative that the immigrant community understand the meaning of these proposed changes to the “public charge” rule, so that they continue receiving benefits for which they qualify,” said Alexis Duecker, Executive Director of Esperanza Immigration Legal Services. The changes, if made permanent, would likely lead to broad decreases in participation of Medicaid and other programs among immigrant families and their US born children. “The proposed rule, if implemented, would unfairly punish immigrant families and US born children who lawfully receive public benefits,” expressed Diego Tapia, Ceiba Program Director. Ceiba and EILS will provide information at the session about what the public can do to prevent the implementation of the rule. At the information session, Ceiba and EILS will also provide information regarding financial assistance to pay for the cost of applying for immigration relief. For more information, call 215-324-0746. On October 9th, 2018, Ceiba serve as a co-convener for the Reinvest Philly Summit. The Reinvest Philly Summit will address strategies to combat redlining, displacement, and gentrification using tools like the Community Reinvestment Act, small business development, and partnering with healthcare and financial institutions as anchors of community development. Click here to register for the event using Ceiba’s co-convener discount code. • Who Can Stop Redlining? 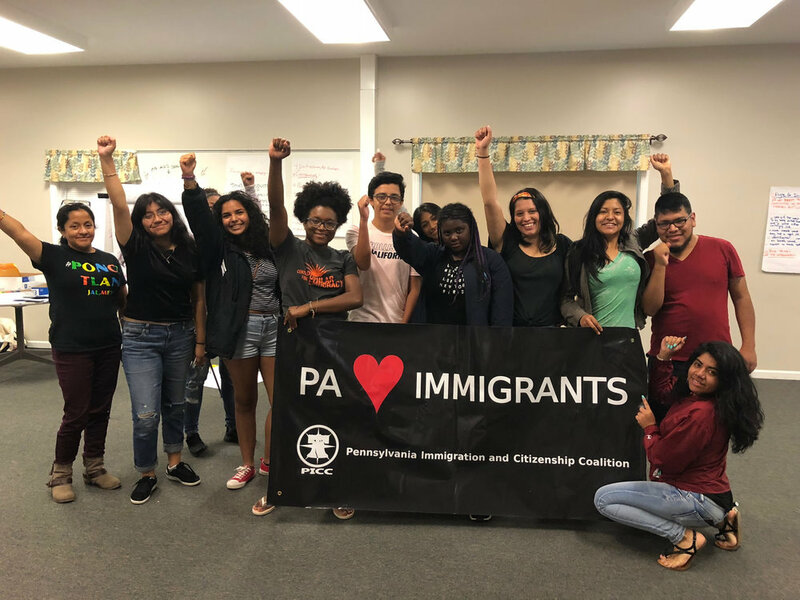 Two of Ceiba's youth attended the Pennsylvania Immigration and Citizenship Coalition's (PICC) Youth Convening on August 17-19 in Harrisburg, Pennsylvania. They joined 24 other immigrant youth from across Pennsylvania to learn about organizing, leadership development, and community building. Ceiba congratulates Dulce R., one of its first 2018 United Way Ira Lubert Matched Savings Program Graduates. Ceiba helped Dulce R complete her first tax return in 2014. At that time, Ceiba helped Dulce complete three years of prior year tax returns, in which she was eligible to receive the Earned Income Tax Credit (EITC), a credit of up to $6,318 per year. Ceiba has done Dulce’s taxes since 2014. In 2017, Dulce enrolled in Ceiba’s Ira Lubert Matched Savings Program for First Time Homebuyers. As part of the program she completed six hours of financial literacy and five hours of housing counseling with Ceiba. In June of 2018, Dulce purchased her first home in Philadelphia for her family using her tax refunds, savings, and the funds from the matched savings program. Congratulations, Dulce! On Wednesday, September 19th at 5:00 PM, Ceiba and Esperanza Immigration Legal Services (EILS) will organize a FREE Immigration Legal Screening + Immigrant Rights and Tax Reform Workshops. Learn about the ITIN, how the tax return will affect ITIN holders, and your rights if confronted by ICE. After the workshops, get screened for possible immigration relief by immigration attorneys, accredited representatives, and trained volunteers. The event will take place at Ceiba, 174 Diamond St. Philadelphia, PA 19122. Please RSVP by calling 215-634-7245 to reserve your spot. On Wednesday, June 20th 2018, at 5 PM, Ceiba and Esperanza Immigration Legal Services (EILS) will organize a FREE immigration legal screening clinic. At the clinic, EILS, Ceiba, and a team of trained volunteers will perform comprehensive immigration legal screenings for all types of immigration relief, including asylum, family petitions, U-Visas, and VAWA. “At the screening, we will also provide a Know Your Rights workshop and information regarding financial assistance to pay for the cost of applying for immigration relief,” expressed Taylor De La Pena, Ceiba Program Coordinator. As part of the session, Ceiba and EILS will inform attendees of their rights if stopped by ICE. On Wednesday, May 16th 2018, at 5 PM, Ceiba and Esperanza Immigration Legal Services (EILS) will organize a FREE family petition legal screening clinic. At the session, EILS and Ceiba will share information about the eligibility requirements and application process for Lawful Permanent Residents and US citizens to petition family members. A Lawful Permanent Resident may only petition for his/her spouse and unmarried children. After the information session, EILS, Ceiba, and a team of trained volunteers will perform immigration legal screenings for individuals who wish to petition family members. “At the screening, we will also provide information regarding financial assistance to pay for the cost of applying for immigration relief,” expressed Taylor De La Pena, Ceiba Program Coordinator. On Tuesday, April 24th 2018, at 5 PM, Ceiba and Esperanza Immigration Legal Services (EILS) will organize a FREE immigration legal screening clinic.